What are some other cities, towns, and suburbs near Ha Noi, Viet Nam? Find the closest city and explore the surrounding area. 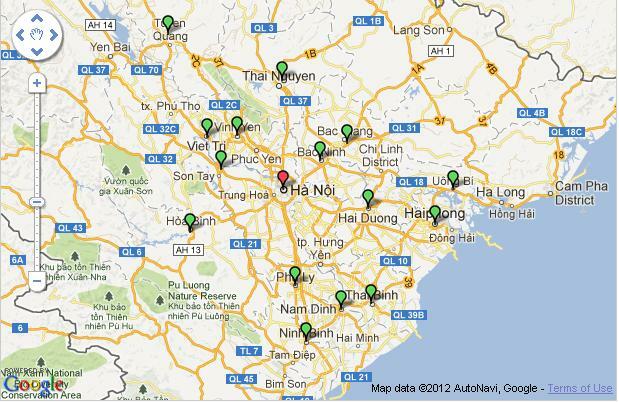 The center of each city listed is within 150 km of Ha Noi, Viet Nam. Hi, we are 2 people and we would like to know how much cost the trasfer from Halong bay (about a 12) to Ninh Binh for 22 April. Hello,I'm a traveler that come from Taiwan.I would like to know that do you transfer passengers from Hai Pong to Hanoi?How much the total fees for 4-seat vehicle?Including me,there are two passengers needs to pick-up.Please reply me as soon as possible.Thank you. ← Package Hanoi – Halong Bay 5 days 4 nights. Let me knouw the price of below transportation. 2015 Apr 10 Fri. 2 persons. how much is 7 seats? how much is 7 seat? Could you please tell me how much would cost a transfer from the Hanoi Airport to Ninh Binh (to Mua Cave ecolodge) for 2 people on the 16th of August. Thank you!